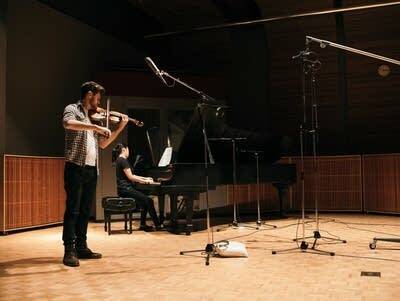 23-year-old violinist Blake Pouliot is quickly becoming one of Canada's most promising young artists, and is the Grand Prize winner of the 2016 Orchestra Symphonique de Montreal (OSM) Manulife Competition. Mr. Pouliot has been described by the Toronto Star as, "One of those special talents that come along once in a lifetime", and after his performance of the Korngold Violin Concerto at his Montreal Symphony debut with conductor Vasily Petrenko in February 2017, he was described by Montreal's La Presse as "Clearly. Absolutely. Undoubtedly virtuoso..."
Mr. Pouliot is currently a Professional Studies Certificate candidate at the Colburn Conservatory of Music in Los Angeles, where he studies with Robert Lipsett, the Jascha Heifetz Distinguished Violin Chair. Blake Pouliot is accompanied in these performances by pianist Hsin-I Huang.